Can you spot the mistake on ESPN’s pre-Clasico stats graphic? Deary me. Deary, deary me. It was supposed to be ronaldo! They were doing ronaldo’s best season ever at real compared to messi’s! So your the FAIL! @Unkown: I really don’t think that’s the case young Padawan. Just a Grade A balls-up from the ESPN graphic department. The real Ronaldo never scored more than 24 league goals in a season for Madrid. c) *you’re. And fail is a verb. @unknown. re: B)…the real ronaldo did play for real madrid once upon a time. you fail too. Also my guess that is was probably on an American sports center. The Americans didn’t know which Ronaldo to use. it’s supposed to be cristiano ronaldo’s pic, bunch of dummies!! I´ll jump the bandwagon! Unknown is wrong! And possibly a douche! You guys are all idiots. Deal with it. Ronaldo should be in a Barcelona shirt, thats the only thing wrong there. Y’all just got trolled by Unkown. Deal with it. 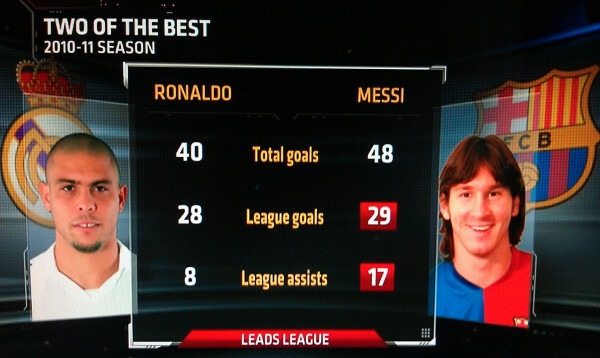 I can’t believe you guys didn’t realize it was supposed to be Cristiano Ronaldo and Messi stats. This is supposed to be Cristiano Ronaldo’s stats. End of the discussion. @Unknown – thanks for trying to copy my name, bravo to you.